Now, these are almonds, nuts. In the Atkins diet, he says, “Hey, you have to limit your nuts because they’re kind of carby.” But the truth is, you can eat as many nuts as you want. Every time you eat nuts, you ought to think, “Man, I’m burning that fat.” Because nuts, they’re delicious and they’re low carb. And what I do here, I take the total carbohydrates of 6 grams, you subtract out the fiber and 6-4 is 2 to get 2 net carbs, but then you have to see “How many servings do I usually eat?” Well, I usually eat two servings, which is 8 net carbs. And then, this is a pound of nuts. 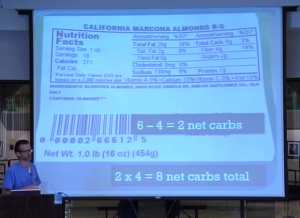 So a pound of nuts has 16 servings, so 16×2 is 32. So you eat the whole pound of nuts before you get as many carbs as there are in that one sandwich. So this is a delicious snack. There was one time I heard, they went through and they were on the news and they said “You need to eat protein before you go to bed, it helps you burn fat while you’re sleeping.” The truth is, you need to eat protein all the time every day – protein and fat. Because you burn fat while you’re sleeping and while you’re awake and all day long. Nuts are a wonderful snack. I like almonds — we’ll talk about that more in the food section, but I like almonds and the ones that are raw are very sweet, the ones that are salted replace chips — salted almonds replace chips because, “Oh, I’m not really supposed to eat chips.” You eat salted almonds and you can eat them all day long — or salted pistachios, cashews. If there’s not a nut that you like, you need to go find one. Because nuts are gonna help you. Another way you can do it is say, “Hey I’m gonna only eat protein and vegetables.” I kind of did this as part of my diet at one time. I said, “Look, I eat vegetables, I eat protein, I’m cutting the carbs out,” which is kind of similar to “Cut the Killer Carbs,” but it’s just a different way of thinking about it. I didn’t like the Atkins diet because the Atkins diet seemed to me, mentally, like, “Oh, you just eat a bunch of fat.” That doesn’t sound healthy. What made sense to me mentally was a protein and vegetable diet, even though it’s the same thing. Another option you can do is just cut the wheat out. 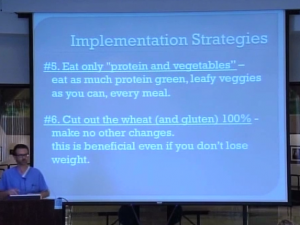 Cut all the wheat and gluten, go 100% gluten free and make no other changes to your diet whatsoever. And if you do that, you have health benefits even if you don’t lose weight. If you cut the wheat out and you’re not losing weight but you want to, then you need to start cutting some other carbs to kind of get your carb level down. Basically, if you eat a diet of protein and fat and green, leafy vegetables, you don’t have to count carbs. And that’s what the Dos are. On that list, there’s the Dos. Everything in the Dos, you can eat as much as you want to, anytime, and you’re still gonna lose weight, lower your blood pressure and improve your blood sugar. Then after the Dos, there’s a section of Do, but you Need to Count the Carbs because those are more carby. And that’s what adding other vegetables is about. When you add other vegetables, then you need to count the net carbs. Always eat until you’re satisfied, because on this type of lifestyle, you shouldn’t feel hungry. We’ll show the slides about how I eat, I eat a ton. These are the Dos, it’s Do Eat as Much as you Want, you don’t have to count carbs. I gave you the full list, for people who want a list of ideas. It says on there zero-carb protein smoothies — I think there’s no such thing as that. What is should say is low carb. Usually it’s 2 carbs for like 45 grams of protein. I’m not gonna read all that, I’ll let you go through it. The next section is, Do Eat as Much as You Want, but Count the Carbs. That’s because these foods, they kind of build up and let’s say you’re trying to stay below 60 net carbs a day. And if you start eating some of these foods then you want to know how much you’re eating because the carbs can build up. The first thing, full-fat fermented dairy — if the dairy is fermented, which means yogurt or cheese, it’s got less sugar in it; it’s got less carbohydrates in it. Because the fermentation process takes it out. Also, full-fat dairy, things like heavy cream, whipping cream, butter — you can eat as much as you want. Just kind of look at the carbs, watch the carbs. The full fat dairy that has the most carbs in it is gonna be milk. Milk has a carbohydrate in it called lactose. The heavy cream or the whipping cream is mainly fat. It’s less carbohydrates and mainly fat. And a great dessert is fruit: you put the berries on top of the whipped cream and you can have that and it tastes wonderful. So fruit, you can have all kinds of fruit but you should check on the carbs, except for these: bananas, pineapple, grapes, raisins and dried fruit. And the reason is that those fruits are exceptionally high in carbohydrates and so those should be avoided. Do I eat grapes sometimes? Yes. Do I eat bananas sometimes? Yes. And condiments, eat all the condiments you want but the ones that don’t have sugar in them. Ketchup has sugar – either high fructose corn syrup or sugar itself so if you’re gonna eat ketchup, count the carbs that are in your ketchup. And this was an interesting realization for me — your weight is not your fault. You didn’t know you were feeding your body a fuel that it didn’t understand. All your life you thought it was normal. All you have to do to achieve and maintain your ideal body weight for life is feed your body a fuel and a food that it understands. 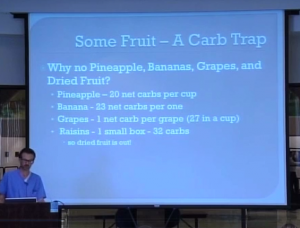 The reason you don’t eat the pineapples, bananas, grapes and dried fruit is that it’s a carb trap. One cup of pineapple has 20 net carbs; one banana, 23 net carbs; and a grape has 27 net carbs in a cup. So if you’re trying to stay below 30 or 60 net carbs, then you have — there’s one net carb per grape. It makes it easy to count, though. Raisins, a small box of raisins has 32 net carbs. That’s why dried fruit is out. Dried fruit is super concentrated.